It's been awhile, friends. Many things have happened since my last update - getting married, my father having unexpected major surgery and recovery over the Christmas holidays, and the most dramatic - moving to Hong Kong. My now-husband accepted a teaching position at HK Polytechnic University in the Kowloon section of the city, and now I'm writing and editing from the other side of the world. It's amazing how the sea of life tugs you into the undertow, and things that are important - like my writing, like this blog - get lost in the quest for survival. But now we are officially into the Year of the Yin Fire Rooster here in Asia, which calls upon us to take "intuitive action" - precisely what writing is. My New Year resolutions are to spend more time loving and doing activities that I love, such as writing for you, my dear readers. As the lit-up Samsung sign in Hong Kong Harbor told me my second day here, "Be Fearless." Fresh starts my loves! Without further ado, enjoy my review of Hunt for the Wilderpeople - an indie feature by Majestical Pictures Limited I was lucky enough to watch on the plane ride over to Hong Kong (make the most of the journey!) that speaks to the personal themes in my life lately - survival, family, and learning what's truly important. What could a wise-cracking city teenager and a cantankerous old man have in common? A penchant for trouble, of course! 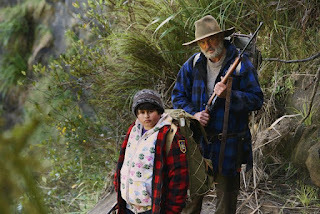 Hip-hop loving orphan Ricky Baker (Julian Dennison) doesn’t expect much when he gets sent to his latest foster home in the wilds of New Zealand (filmed entirely on location) that includes warm-hearted Bella, (Rima Te Wiata) and her husband Hec (Sam Neill), a disgruntled backwoodsman who'd much rather spend time with his beloved dog Zag than this chubby city slicker kid. However just as Ricky becomes accustomed to his quirky new family, tragedy prompts the authorities to send him packing. Ultimately, Hec and Ricky decide to make a run for it along with their dogs, prompting a nationwide manhunt, misunderstandings, and general hilarity. Ricky gets down to business. Making a movie that succeeds in being thoughtful and funny is no easy task, and yet "Wilderpeople" does it effortlessly under the thoughtful direction of Taika Waititi. The overarching theme is that family is what you make of it.The lush cinematography of the New Zealand countryside are worth the watch alone, but the brilliant chemistry between Hec and Ricky is what makes "Wilderpeople" a standout. Neill has long been a favorite of mine, ever since his turn as Merlin in the 1998 miniseries, with a penetrating gaze that always looks untamed. His deadly serious demeanor coupled with Ricky's happy-go-lucky attitude makes for humor that is both biting and self-deprecating. At one point when Ricky and Hec are hiding under some brush to escape officials scouting the woods, Ricky likens the moment to when Frodo, Sam, and the other Hobbits are hiding from the Ring Wraiths in the Lord of the Rings - The Fellowship of the Ring movie - also filmed in New Zealand - a reference which of course goes straight over Hec's head. The supporting characters hold their own - Rachel House is wonderful as Paula, the stone-cold director of the child welfare service determined to get Ricky back by any means necessary - whether with trail mix or a SWAT team. As the weeks turn into months, the strange duo find themselves increasingly relying on the kindness of strangers, many of whom are a more than a little strange themselves - such as Psycho Sam, played with brilliant abandon by Rys Darby. (HERE THERE BE MINOR SPOILERS MATEY): Bella's death is paradoxically both perfunctory and profound. How and why she died is left to the imagination of the viewer, because what is truly important to the story is the different ways Ricky and Hec react and grieve her passing, and it is the results of those reactions that give her too brief role in the story great meaning. (HERE ENDS THE SPOILER). Underneath the ridiculousness runs strong themes of family ties and how those bonds of love can be tested and ultimately, triumph in the face of life's challenges. Ricky learns how to rough it in nature, gaining Hec's respect, and Hec learns how to love again. Currently available on DVD and streaming. 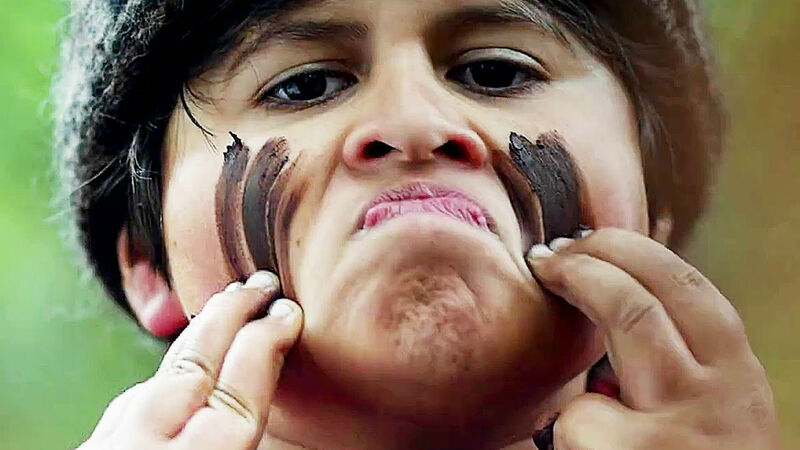 Jackaroo sez: While lesser films would try to tack on a tidy wrap-up moral lesson for the viewers to take home, "Wilderpeople" is an organic adventure about the messiness of life, how we survive, and the people along the way that help us do so. Great review! sounds like a movie worth watching. Loved the summation at the end--the messiness of life, survival, and helpful people--says it all. M.